Never take the good things for granted, especially when they’re your favourite food! I lived a spoiled life in the world’s biggest artichoke garden without even knowing, until I moved to an artichoke-deprived land in 2012. Before the topic came up with in a conversation with my friend Nina, who is from India and had never eaten a fresh artichoke before living in Europe, I had never considered the destiny of billions of people who live artichoke-less lives in corners of the world where these magical flowers never bloomed. They’re lucky to be still eligible to taste artichokes for the first time. 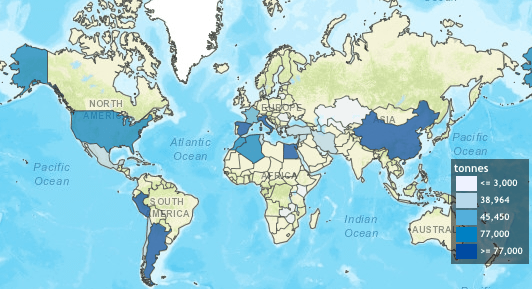 As for myself, I know what artichokes taste like, and I miss them dearly, as I left Italy (artichoke galore) to live in the Netherlands, a place where – as you can see from the map – artichokes don’t dare to grow. The good news is As Soup As Possible travelled to Rome to show you something “artichokely” tasty and bring you a piece of advice: if you ever find yourself in Rome, don’t miss out, eat artichokes! The Jewish Ghetto of Rome. Not everybody knows that part of the traditional Roman cuisine is kosher, having been influenced over time by Jewish cuisines. Rome’s is the second oldest Jewish ghetto in the world, the first being Venice’s. It’s also the most enduring one, as it was established by the Isola Tiberina by Pope Paul IV in 1555, then abolished with the end of the Papal State, in 1870. The neighbourhood was one of the least appealing to Romans when it was designated to become the ghetto, because of its vicinity with an area often subject to the river Tiber’s floods. The Jews were forced to fund the enclosure of the area by means of a wall and curfew was enforced upon the community. The poverty in which the community was forced to live for centuries reflects in its cuisine, made of humble ingredients, although glorified by elaborate and refined preparations. One of them is carciofo alla giudia, which I dare to deem one of the most heavenly manifestations of artichoke. Jewish-style deep-fried artichokes are a pillar of the local cuisine and a perfect example of the tricks Roman Jews had to figure out to turn simple ingredients into fancy dishes. Once cooked, carciofo alla giudia looks like a golden flower, with its crunchy, savoury petals raying out from a tender, delicious core. Carciofo alla giudia is made with a local cultivar of artichoke called mammole or Romanesque artichoke, recognisable by its round shape, purple-green colour and fleshy leaves arranged in a compact structure. Compared to other artichokes, the Romanesque has the advantage of not having thorns, which allows to deep-fry it whole, without having to remove the thorns usually found in the center of other artichokes. 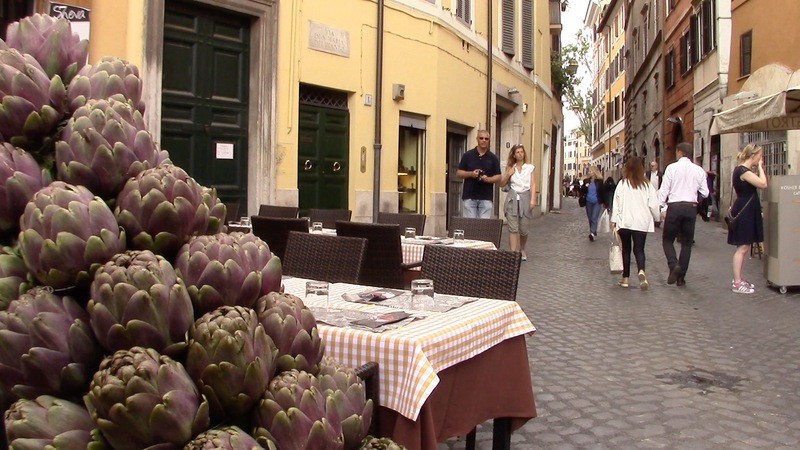 There are many other artichoke recipes in the Roman cuisine and other cuisines around the peninsula. Carciofo alla giudia, however, is one of the most fascinating, as its alchemy transforms the shape, texture of this vegetable dramatically, enhancing its aroma. 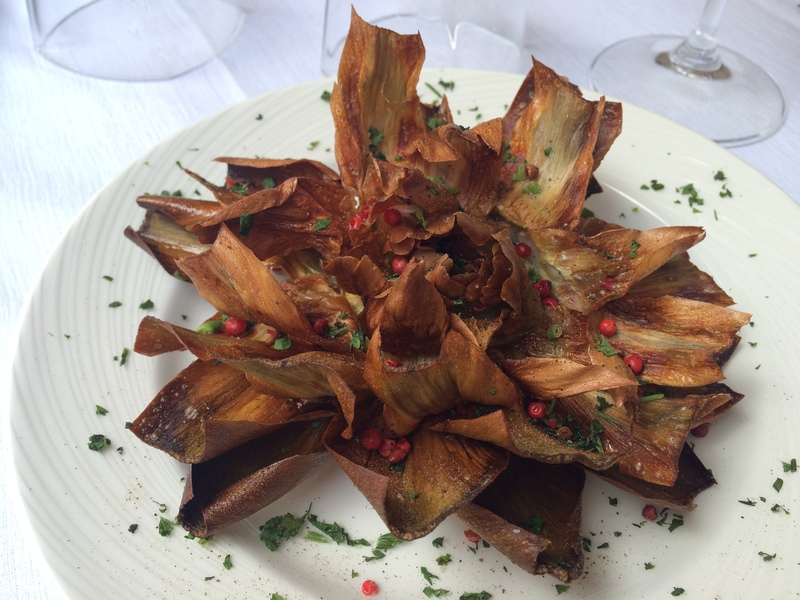 To achieve its characteristic final shape, the artichoke needs to be prepared in a special way. That’s why I went to via del Portico d’Ottavia, the heart of Rome’s ghetto, to find out how it’s made. I met Ilan Dabush, one of the four Dabush brothers, owner of Ba’Ghetto and Su’Ghetto bistrot, renown kosher restaurants. His father fled from persecution, like many Libyan Jews escaping pogroms (1967) and established his first restaurant in the Roman ghetto, integrating Middle-Eastern influences in his cuisine. After a chat with Ilan – and a tasting of carciofo alla giudia, yum! 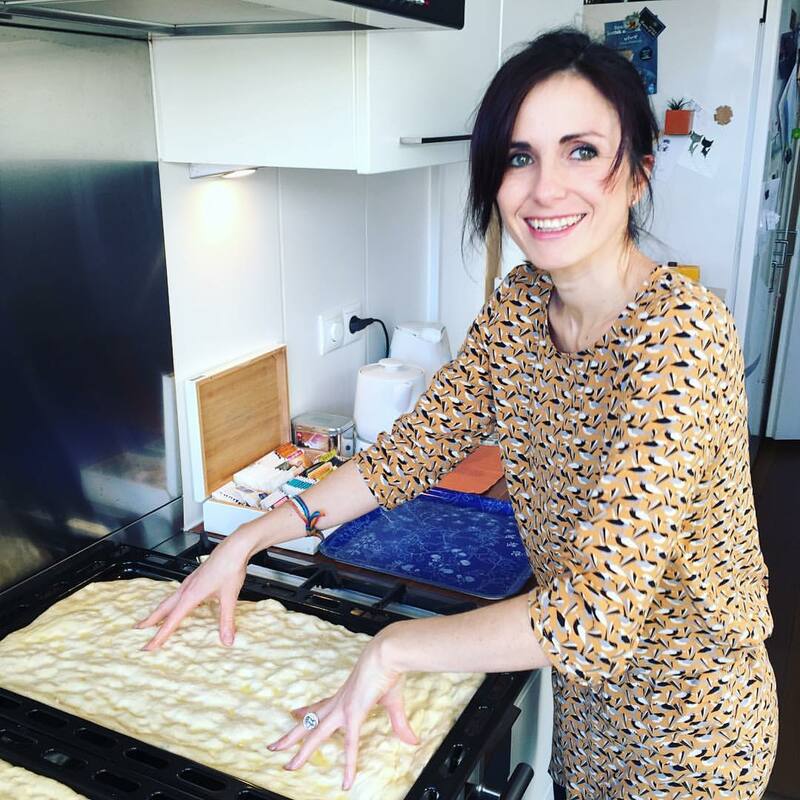 – I reached Antonio Perdicchia, the chef, in his kitchen, to watch the magic happen. Some more information for those who are not familiar with artichokes. 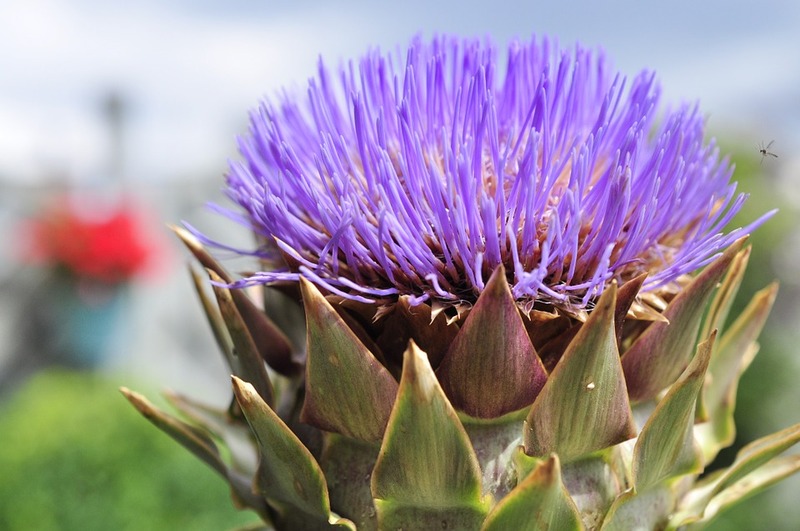 Artichoke (Cynara scolymus L.) is a tall perennial plant of Mediterranean origin. It grows in Southern Europe, North Africa and the Americas. The Dutch have a role in the history of artichoke after all, as they were the ones to export it to England of Henry VII in the XVI century. The introduction of the plant in the USA is due to the Spanish and the French, and it didn’t happen until the XIX century. Depending on the climate, artichokes are harvested from Autumn to Spring, the Romanesque being one of the latest crops, their best time being between March and April. The part we use in the kitchen is erroneously recognised as a flower. In fact, artichokes are only cooked before their blooming. What we eat is the bud, made of leaves with the shape of petals (the correct botanical term is bracts). They can be consumed fresh – in salads or cooked in a variety of recipes, preserved in oil or frozen. Artichokes are particularly rich in tannins and iron, are beneficial to the liver and are widely used in detoxing (when you don’t deep-fry them, that is). They are low in calories, diuretic and rich in inulin, which makes them very popular in anti-cellulitis diets and recommended for diabetic patients. An interesting and perhaps unexpected use of artichokes is in cheese production: an entirely plant-based coagulating agent (rennet) made from artichokes or their wild cousins cardoons (Cynara Cardunculus) is used to produce vegetarian-friendly cheeses. Ciao! Grazie della spiegazione del carciofo alla giudia, da un pò di tempo che volevo farlo!! Grazie dei cenni storici. Next PostGragnano: Made For Pasta.